I literally bounced in my seat when I saw Heroes Return pop up as being in stock and ready to ship a couple weeks ago. I quickly ordered my copy lest that lovely little "In Stock" button disappear, and I sat back to wait--impatiently--for it to show up on my doorstep. 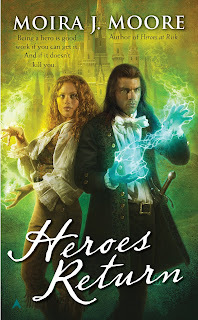 I adore Moira J. Moore's Heroes series because of the two main characters. Lee and Taro are incorrigible, endearing, at times pull-your-hair-out maddening, but they are two of my favorites and I look forward to each adventure with gleeful anticipation. I think about these two a lot when I'm not with them. I think about my favorite scenes--the ones where the let their defenses down for perhaps two seconds at a time and actually communicate. Sometimes I have to go re-read one or two of those scenes to remind me how subtle and real they are. We've hashed out these covers before in detail and I won't go into this latest disaster. Much. Except to say that never does blue lightning crackle between Taro's meaty paws. If that image worries you at all, let me set your mind at ease. Also, he is rather devastatingly handsome. Despite the way he is portrayed on the cover. This is the fifth installment in the series. Not in their wildest dreams did Source and Shield Pair Shintaro Karish and Dunleavy Mallorough imagine they would ever be taken away from High Scape and reassigned to Taro's homeland of Westsea. But that is exactly what's just happened. Without so much as a by your leave, the newly minted Emperor orders them to swear fealty to him and pack their bags for the remote coastal city where Taro was born, and where he lived the first bleak eleven years of his life. Lee dreads the whole notion, what with the politics that are involved and the fact that Taro's mother the Dowager Duchess--otherwise known as the Wicked Witch of the West's less nice sister--lives right next door to where they'll be staying. But, as it turns out, the Duchess should be the least of Lee's worries. For there is something wrong afoot in Westsea. The new Duchess is scrambling to command the respect of her people, the Emperor's guards have been assigned a permanent post there amid rumors the people are engaging in spell casting, and the level and frequency of natural disasters in the area are increasing with every day that passes. Add to this the fact that Taro's abilities to channel are becoming erratic, Lee's passing interest in casting begins to ratchet up a few levels, and the Triple S seems awfully suspicious of them and their recent activities, and these two are in for quite the couple of years at this their new post. Nothing is ever easy in the world of Taro and Lee. I don't know why I keep thinking things will settle down for a spell and they will be able to sort a few rather important things out. Like their monumentally tragic communication problem. Because Heroes Return is all but a formal treatise on the failure to communicate and the disasters that result from said failure. I'm starting to feel like my favorite Source and Shield have fallen into a dangerous and dysfunctional habit of making assumptions rather than talking to one another. And I'm honestly afraid of where they'll end up if they don't address the situation in a patently overt manner. Because everything was subtle in this installment. Nothing was straightforward, upfront, or frank. Much of that wasn't Lee's or Taro's fault and, as such, I felt very defensive on their behalf. They were kept apart so much and they weren't fighting to be together. They need to do that a bit, I think, with how important they really are to each other. More so than in the previous books, even larger forces than they are used to seemed to be buffeting them about and I have the feeling there will be more dire reveals to come. This felt very much like a transitional piece and, as such, it was harder to say goodbye at the end, feeling so worried and discombobulated as I did. I feel as though the world itself may turn on them and I sat fretting for quite awhile after finishing. I know there is a sixth book on the way and that is very reassuring. What I don't know is what lies beyond that. Will things wrap up? Will there be more adventures beyond? Because nothing about Heroes Return is neat and tidy and I am going to need some kind of meeting of the minds and souls to calm my poor heart. As always, I fell into Moira J. Moore's world, and into company with these loved characters, the moment I started reading and I did not surface again until the final page. I very much enjoyed the change of setting and the peeks into the Taro's origins and how different it is from other places in their world. Taro made me particularly proud in a couple of key scenes--one of them just especially well done. And I like that Lee is branching out in her interests, even if those interests give Taro fits. After all, Lee is right. He really is adorable when he's mid-fit. Another great installment in one of my very favorite series. Your daughter is darling btw. Angie, I loved this book. I'm a sucker for anything about a big house filled with big-personality aristocrats and servants. Adding Taro and Lee to all that is a huge bonus because I love them so much. I laughed a lot. Lee's observations were hilarious. I do think Taro and Lee are smarter than they were allowed to be in this book and that bothered me. And I'm also very worried about the future. I haven't read this one yet but from the reviews I'm afraid to read it and then not have the book after it ready to go. So I may wait till it's closer to the release date of book 6. Resenting the Hero has been on my tbr list for over a year now...someday!!! You're completely right about the covers - I wouldn't have picked these up in a million years. But after reading this review? I think I shall avoid my icky-cover policy and get a copy of Resenting the Hero! I'm so excited to start this series! Cool, I am going to check this series out. And you rock for putting the reading order down. Oh now I am SO WORRIED about what happens to Taro and Lee in this book! Cause really, like you say, those two need to talk to each other, basically just fess up how much they really care. *sigh* I might be like Janice and wait till #6 is a little closer to being out. But I probably won't, cause I'm impatient like that. OMG. I have been almost excited about this book as Mockingjay. Almost. I didn't know it was out! Trip to the bookstore? woo hoo! Jen, aw, thanks. And Moira is one of those real diamonds in the rough. I love spreading the word about her and these great books. Karen, *grin* I'm so glad to hear that. Why do we not live in the same place so we could talk about all of the books we mutually love in person? It's cruel is what it is. Then we could reassure each other through our fears. I am worried with the way it ended. I won't deny it. Kay, oh definitely do. They are *nothing* like their covers. Promise. Tiah, I hate it when I can't figure out the order of a series I'm interested in starting. Glad it can come in handy for someone else. Michelle, no no no. You must read it so we can talk. Elizabeth, YAY! And rightly so. Pity about that cover! I went to add the first book to my list after reading your review, and found it was there already. Probably from when I read your reveiw of the last book in the series! I'll have to get to it soon - sounds like a fun read. Darla, it is. *sigh* And they are definitely fun reads. You will find yourself smiling and laughing.